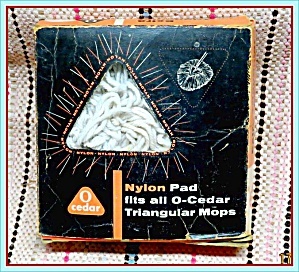 Promising it will fit ‘all O-Cedar Triangular Mops,’ the pink and black die-cut box for this Extra Triangular Nylon Pad has a 1954 copyright from American–Marietta Co. The box details the nylon yarn’s exclusive ‘Magne-Static’ action to pick up dust; the way the pad easily slips off for washing and replacement; and how simply the soiled pad can be swirled around in warm sudsy water to clean. This Nylon Pad will clean as quickly as your Nylon Stockings… and is offered with the O-Cedar Unconditional Money-Back Guarantee! And the retail box details all sorts of other great advantages over other mops! The mop is As New in the box, although it does show some fading from its original blue color and has a few dust spots showing through. The box itself shows signs of shelf wear and some edge/corner wear. Overall, however, it’s a nice representative of the newest advances in mopping during the post WWII era! It will make a great addition to your country store or laundry/cleaning collection!